Cinderella provides several operators that allow one to plot information about mathematical functions. Besides simple function plotting, information on extrema, zeros, and inflection points can be shown. The following functions allow to plot the graph of a function that maps a real number to a real number. Description: The plot operator can be used to plot a function. The function must be given as an expression <expr>. This expression must contain the running variable # and calculate either a real value for a real input of # or a two-dimensional vector. In the first case, the plot operator will simply draw the function. In the latter case, it will draw a parametric plot of a function. The coordinate system is tied to the coordinate system of the geometric views. Instead of # also other running variables are detected automatically. If there is only one free variable then this variable is taken as running variable. If there are several free variables the plot(...) function searches for typical names in the order x, y, t, z. Examples: In its simplest form the plot operator can be used directly to plot a function. 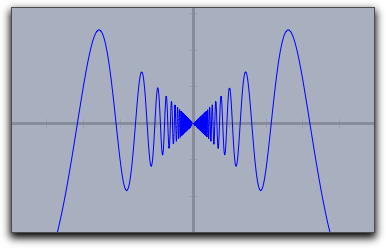 The line plot(sin(#)) immediately plots the function sin(x). The same plot is generated by plot(sin(x)). Modifiers: The plot operator supports many different modifiers. Some of them have to be explained in detail. They can be used to modify the appearance of the curve, to modify the plot range, to modify the position on the screen, and even to display maxima, minima, zeros, and inflection points of the function. An overview of available modifiers is given in the table below. Observe that some of the modifiers may even be invoked with different types of arguments, resulting in a slightly different effect. One can easily vary the plot range by setting the start and stop values. For instance, plot(f(#),start->A.x,stop->B.x) helps to control the plot using by the x-coordinates of two free construction points. The resolution of the plot is controlled automatically and adaptively. The plot(...) function automatically increases its resolution close to singularities. The following plot shows the output of the call plot(sin(1/#)*#). Observe the quality of the plot close to the origin. Usually jumps in functions are detected and by default they arenot connected. One can connect them on purpose by setting connect->true. 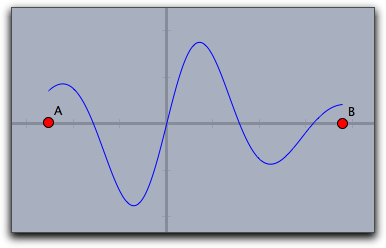 By using the modifiers for a curve's significant points one can display zeros, minima, maxima, and inflection points. The following three pictures demonstrate the use of these operators. The Dashing options for a plot statement are identical to those for lines and circles. They can be controlled by the modifiers dashing, dashtype and dashpattern. dashtype Can be an integer between 0 and 4 and selects one of four predefined dashing patterns. The value 0 creates a solid line. dashing is a real number specifying the unitsize of the dashes. Simply setting dashing->5 already creates a standard dashing. dashpattern Can be set to a list that specifies the length of the successive dashes and empty spaces. Here the hue function was used that cyclically generates rainbow colors. Description: Identical to plot(<expr>) but with a specified running variable. Warning: The singularity treatment of the fillplot(...) statement is by far less subtle than that of the plot(...) statement. So although the modifiers allow to draw functions also with fillplot one should use plot for function plotting. Description: This function is very similar to the fillplot(...) statement. However, instead of highlighting the are between a function and the x-axis it highlights the area between two functions. Modifiers: This statement supports exactly the same modifiers as fillplot(...). Colorplots are useful to create visual information about functions defined in the entire plane. They can associate a color value to every point in a rectangle. Description: The colorplot operator makes it possible to give a visualization of a planar function. To each point of a rectangle a color value can be assigned by a function. In the function <expr> the running variable may be chosen as # (for more on running variables, see below). 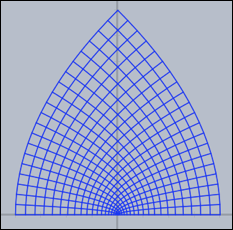 However, it is important to notice that this variable describes now a point in the plane (this is a variable two dimensional coordinates). The return value of <expr> should be either a real number (in which case a gray value is assigned) or a vector of three real numbers (in which case an RGB color value is assigned). In any case, the values of the real numbers should lie between 0 and 1. The second and third argument determine the lower left and the upper right corners of the drawing area. Example: The following code and two points A and B produce the picture below. In the first line, a real-valued function is defined that assigns to two points the sine of the distance between them (shifted and scaled to fit into the interval [0, 1]). 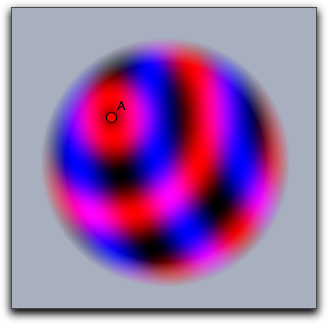 The first argument of the colorplot operator is now a vector of three numbers depending on the run variable # (the red part is a circular wave around A, the green part is zero, and the blue part is a circular wave around B). Finally, C and D mark the corners of the rectangle. If there is only one free variable in <expr> then this variable is taken as running variable and interpreted as a two dimensional vector. If <expr> contains both x and y as free varaibles the these two variables can be used as running variables the together represent the vector (x,y). if none of the above happens also p (for point) and z (for complex number) are checked as running variables. Modifiers: The colorplot operator supports three modifiers. 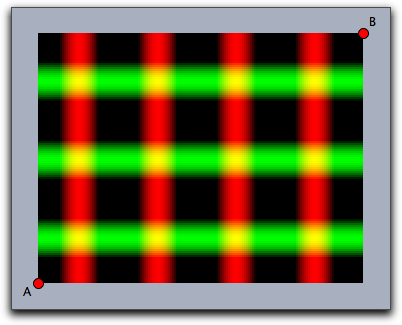 The modifier pxlres can be set to an integer that determines the size in pixels of the elementary quadrangles of the color plot. The picture above was taken with pxlres->2 which is the default value. Setting the pxlres modifier either to 1 or to 2 produces stunning pictures. However, one should be aware that for each elementary quadrangle of the colorplot output the function has to be evaluated once. 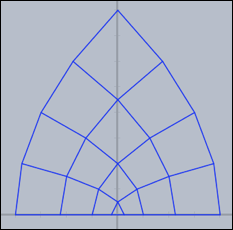 The computational effort grows quadratically as pxlres is linearly reduced. So sometimes it is also good practice to reduce the pxlres modifier in order to gain more preformace. The picture below has been rendered by setting pxlres->8. One can also dynamically change the resolution. For this there is another modifier startres that can be used to have gradually improving plots, thus combining the best of two worlds. For example, using both startres->16 and pxlres->1 you will get a coarse plot during interactive movements, which will be re-calculated automatically with a finer resolution whenever there is enough time. Furthermore, the colorplot operator supports a modifier alpha that is used to control the opacity. This modifier can even be set to values that depend parametrically on the running variable. 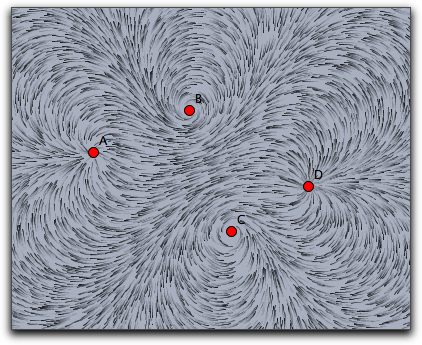 Vector fields can be used to visualize flows and forces. They have many applications in the visualization of systems of differential equations. To generate the picture, a collection of needlelike objects is thrown onto the drawing surface. These needles will be oriented according to the vector field. 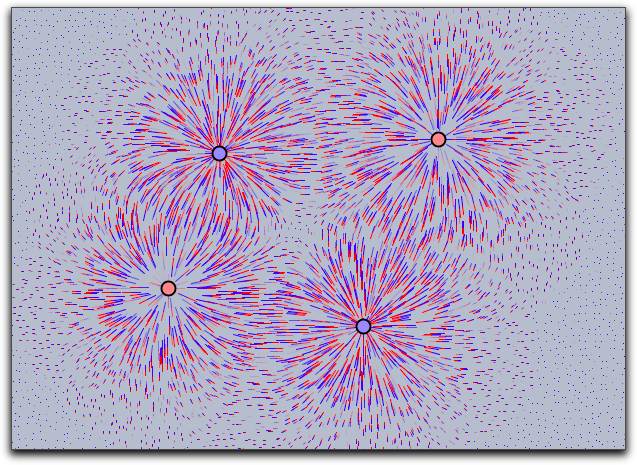 During the animation, the needles move according to the vector field. It is also possible to replace the needles by small snakelike objects that give a more accurate impression of the vector field but take a longer time for calculation. This can be done with a suitable modifier. Modifiers: The drawfield operator supports many modifiers that control the generation process of the vector field. To help in understanding them we first describe in a bit more detail how the pictures are generated. 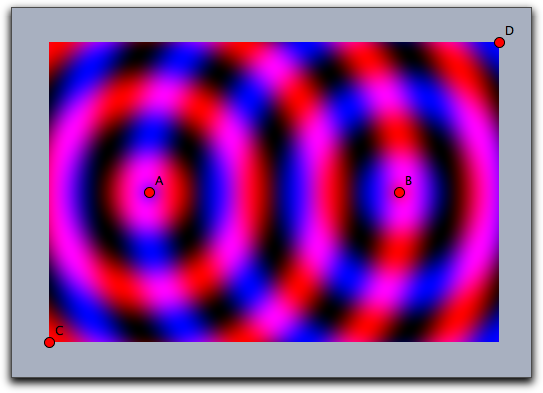 The pictures are generated by showing the movement of some test objects under the influence of the field. By default, the test objects are needlelike. They are initially positioned on a regular grid. 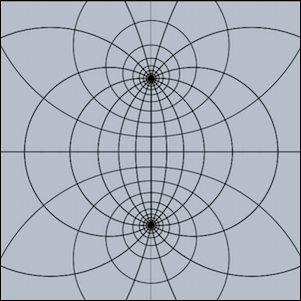 Since this usually creates many visual artifacts, they are randomly distorted within a certain radius around the grid points. During an animation the needles are moved in the direction of the force field. The needles' lengths represent the strength of the field. The following picture demonstrates the original grid. It has been rendered with move->0 and jitter->0. It shows clear artifacts resulting from unnatural alignment in the horizontal or vertical direction. The following picture has been rendered with resolution->5 and stream->true. Description: This operator is very similar to the drawfield operator. However, it takes as input a one-dimensional complex function. The real and imaginary parts are treated as x and y components for the vector field. Otherwise, the operator is completely analogous to the previous one. The modifiers are analogous to those for the drawfield operators. Description: This operator is again very similar to the drawfield operator. However, this time it is related to a physics simulation in CindyLab. No arguments are required, and it shows the forces on a potential test charge that is placed at various locations on the screen. The test charge has mass = 1, charge = 1, and radius = 1. However, no other particle will interact with it. Sometimes it will be necessary to use the factor modifier to amplify the force field. The following example shows the interaction among four charged particles. Description: There is another operator that draws the force field with respect to a fixed mass particle. The particle itself takes no part in the calculation of the forces. In this way, one can visualize the forces that act on a certain particle. 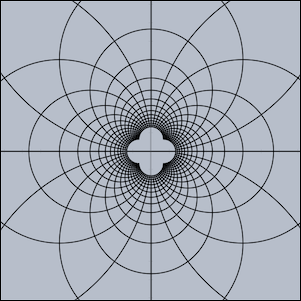 Grids can be used to visualize transformations that map the plane onto itself. With grids, the deformation induced by such a map can be visualized. 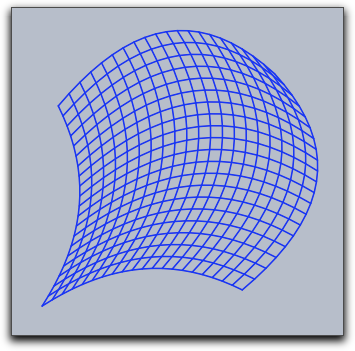 Description: This operator takes a rectangular grid and deforms it by a function given in <expr>. By default the range of the original grid is taken to be the unit rectangle in the plane. The bound of this rectangle may be altered using modifiers. It is also possible to visualize complex maps by using the complex->true modifier. Modifiers: There are several modifiers controlling the behavior of this function. Examples: The following piece of code exemplifies the usage of the mapgrid operator. Is also illustrates the effect of the xrange and yrange modifiers. It displays the effect of a two-dimensional function that squares the x and the y coordinate separately. In the following example we see that generally the grid lines do not have to stay straight or parallel. 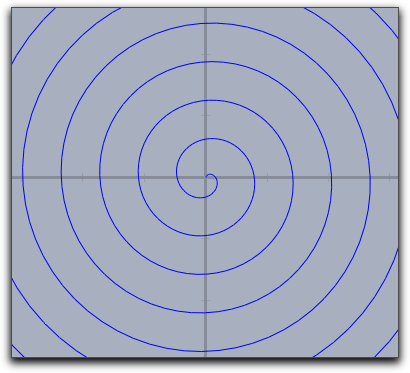 The following simple example illustrates the usage of mapgrid for complex functions. Using the resolution modifier, one can specify the number of mesh lines that are generated. 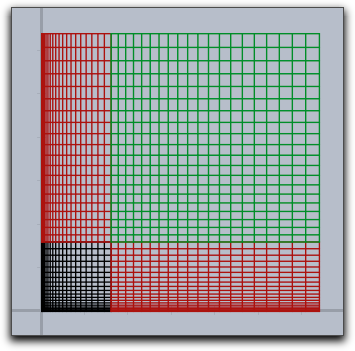 By default, the mapgrid command directly connects the mesh points. This may lead to pictures that do not really map the mathematical truth. Using the step modifier, one can introduce additional steps between the mesh points. The results of the last three pieces of code are shown below. 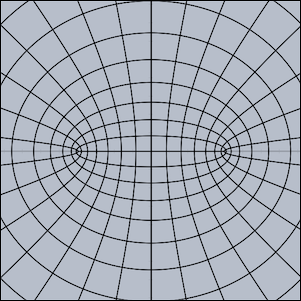 Grids carry very characteristic information about complex functions. 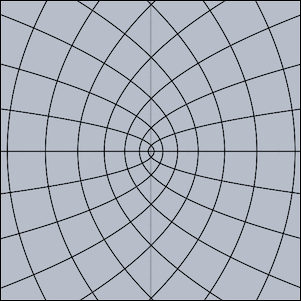 The following three pictures show grids for the functions z*z, sin(z), 1/z and tan(z) respectively. 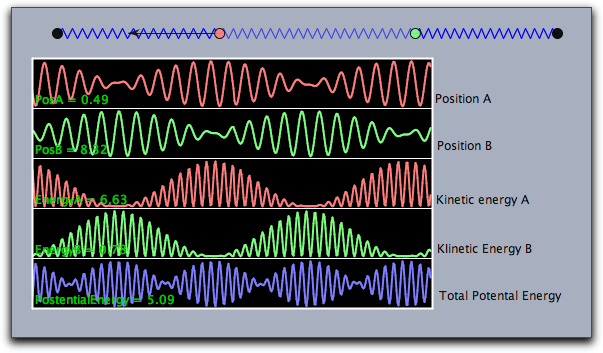 Oscillographs allow to visualize dynamic changes of values in physic simulations and animations. Description: In real and simulated physical situations one is often interested in plotting curves that show how magnitudes evolve over time. For this, the drawcurves operator was created. Here <vec> is a two-dimensional vector that refers to the lower left corner of the drawing area, and <list> is a list of values that are to be observed. 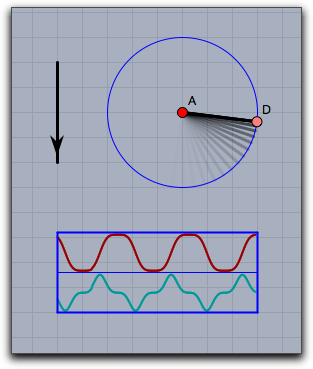 When the animation runs, the values are updated and the corresponding curves are drawn. Modifiers: The drawcurves operator supports many modifiers. Than can be used to change the appearance of the curves and to show additional information. The following piece of code demonstrates the usage of the modifiers. It shows a weakly coupled pendulum and its energy behavior. Contributors to this page: Wurster , Kortenkamp and Richter . Page last modified on Thursday 10 of July, 2014 [08:07:04 UTC] by Wurster.